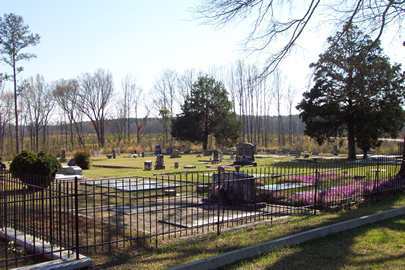 A community cemetery next to Jewell Baptist Church. 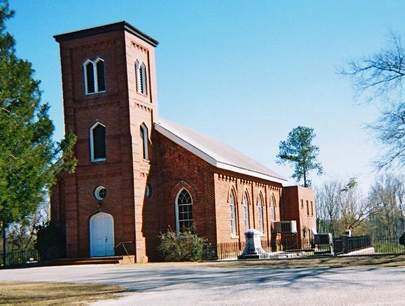 From the Hancock County Courthouse, go 12.2 miles on Hwy 16 East to Jewell, Ga. Turn right on the paved road (which is Hamburg State Park Rd) before the Ogeechee River bridge. Go approximately 0.1 mile to the church on the left. Numbering of the cemetery begins to the left (north) side of the church. Graves numbered 300 or higher have been added after the original survey and are located somewhere in the cemetery. No death date. Last name assumed. "Mama" On same gravestone as Robert Ray Mitchell. T. Sgt 116 Inf. 29th Div. "Father" On same gravestone as Hannay Raley Mitchell. "Mother" On same gravestone as George L. Mitchell. On same gravestone as Pearl Martin Adkins. On same gravestone as Harvey Johnson Adkins. On same gravestone as Arthur T. Redfern. On same gravestone as Sara Mitchell Kelley. On same gravestone as Aubrey Fulghum Kelley. On same gravestone as Connie Roland Kelley. No death date. On same gravestone as Aubrey Fulghum Kelley. On same gravestone as Elizabeth Gay Adkins. On same gravestone as Sherron L. Adkins. On same gravestone as Ramelle Dickson. On same gravestone as Walter D. Dickson. On same gravestone as Martha D. Bales. On same gravestone as Emmett Bales. On same gravestone as Lorena W. Howell. On same gravestone as George T. Howell. "Father" m. Florence C. Jan 9, 1943. M. Sgt. U.S. Marine Corps. m. Lester E. Newsome Jan 9, 1943. Maiden name per obituary. On same gravestone as Edna T. Cox. On same gravestone as Oscar J. Cox. Co. K, 15 Ga. Inf. Corpl. On same gravestone as Mary A. Jewell. On same gravestone as Daniel A. Jewell. Last digit of death year unreadable. 1866 assumed. s/o D. M. & Ida Latimer. d/o Reuben & Maria May. s/o Mr. & Mrs. William Gilbert. 3 graves in Kirkendol plot. Mason. "To die is gain, Be ye also ready for in such an hour as ye think not the Son of Man cometh"
Stone is broken at death year. 1894 is best guess. w/o Denham Cason. "Corinthians XIII"
"Nana". w/o A. D. Cason. "Maj." "Whatever we have known and loved is ours while life shall last - Aloha" "Johnny"
"A successful physician and farmer"
Co. H, 4th Ga. Inf. Infant grave in Hadden lot. Last digit of death year broken. 1880 assumed. s/o Reece Bowen. "Father" On same gravestone as Margaret Virginia Jones Bowen. w/o J. P. Bowen. "Mother"
d/o A. S. Bowen. Last digit of death year unclear. w/o Rev. James L. Ivey. d/o Dr. Horace & Virginia Darden. "Flower too soon faded." w/o Willie and Gracie Chapman. "Suffer the little children to come unto me"
"Let me die the death of the righteous"
Small rock marker in Twilley plot. On same gravestone as Lorenza Butler. No death date. On same gravestone as Myrtle M. Butler. "Of such is the Kingdom of God"
"Body donated to M.C.G." F L T in adjoining circles on gravestone. [w/o Rev. B. F. Mitchell, per indexers]. The Lord is my Refuge. d/o A. C. and H. M. Carr. Buried in the Williams lot near main gate. Buried in Williams lot near main gate. "He was a devoted son - A kind brother - A true friend - A devoted Christian who lived not for himself but for others"
On same gravestone as W. Walter Crawford. On same gravestone as Etheldridge Silas. Death date removed. On same gravestone as Lucy Silas. "We shall meet again in heaven"
"A precious one has gone, A voice we loved is still - A place is vacant in our home - which never can be filled." Age 33 yrs, 6 months, 15 days. d/o E. W. and A. M. Howell. s/o E. W. & A. M. Howell. d/o E. W. & A. M. Howell. w/o W. H. Gockel, Jr. No death date. Pvt. Company B, 2nd Ga. Inf. Pvt. Company H, 2nd Ga. Inf. (1st) w/o J. O. Mitchell, per Bill Jackson. (2nd) w/o J. O. Mitchell, per Bill Jackson. 2 graves in the Mitchell plot. Not found in 2002 survey. All info per Kimbrough list. Age 84 All info from obituary. Age 79 All info from obituary. Age 88 All info from obituary. Age 80 All info from obituary. Wife of Jerry W. Frost, daughter of Ola Dye Howell and Fred M. Howell. All info from obituary.